Successful entrepreneurs do not know the meaning of resignation. Their lives are comprised of constantly reaching for what others think is not possible. Ruth Ellen Miller was told, “No, it can’t be done” too many times when she broached her business idea to more established enterprises in her field. With sheer determination, talent and creativity, she not only prove her detractors wrong, but she emerged as the leader in her field. Ruth Ellen Miller is co-founder and President of NoUVIR Research Company (now called NoUVIR Lighting http://www.nouvir.com/), the leading manufacturer of fiber optic lighting systems specifically designed for museums and historic buildings. Based in Seaford, Delaware, NoUVIR’s illumination systems are no ordinary products: the company has created a technological breakthrough with fiber optics that produces pure-white, stone-cold light. An invention of Ruth Ellen and her father after three years of intensive research, the light emitted from NoUVIR’s fiber optics has absolutely no ultraviolet energy and no infrared energy. Hence, the name of the company, NoUVIR, which stands for No UV (UltraViolet) IR (InfraRed) rays. Ruth Ellen co-founded her company in 1990 to achieve one goal: to provide non-damaging illumination for our national art and historic treasures. Ruth Ellen and her father, who are both scientists, were concerned with the damages caused by light on exhibits. For years, no one knew why or how to prevent this damage. As Ruth Ellen explains, “A museum that we supported before hired the best lighting designers and bought the best lighting systems they could when they built their facility. In five years, however, they found that things were damaged on display.” The Millers are lovers of fine art and historical preservation, and they felt compelled to discover new technologies to stem the damage caused by light on artifacts. The father and daughter team approached some of their design clients in the lighting industry for support. Instead, the industry bigwigs told them that it could not be done. According to Ruth Ellen, “we were told that (1) we could not get enough light through fiber optics or create practical light sources; (2) no one could remove all the heat and ultraviolet light from any light; (3) no one can make smooth perfect beams with any small light fixture, let alone something miniaturized; and (4) most of all, museums were too small of a niche to support any lighting company.” The rejection only strengthened their resolve to develop the project. In 1990, the Millers began their intense research to create the product line. With their knack for quantum physics (the study of the interactions of photons on matter) and mathematics, they conducted hundreds of tests to develop fiber optic lighting systems with no ultraviolet and infrared rays. “Giving birth to revolutionary technology is one of the hardest things you can attempt,” Ruth Ellen says. “New products don’t just happen. Breakthrough inventions are born of sweat, tears and cash.” They needed to create an extremely high-tech product that was cost effective and easy for typical museum employees to use. The father and daughter team went to work in the drawing board in a small R & D facility owned by the company of Ruth Ellen’s father. They also worked nights at home. “I will never forget assembling fiber optic luminaires for a major museum on a folding table at home while watching late night TV.,” Ruth Ellen recollects. After three and a half years, they finally did it! Once the prototype was developed, word about this innovative new product spread fast in the museum community. Convincing curators that this is the kind of lighting they needed, became easier. “Once we made the product, I could hand it to them, and they could hold a bright light source in their hand that was cold,” Ruth Ellen recalls. The first museum to use NoUVIR’s lighting system was the Autry Museum of Western Heritage in California for an exhibit of various artifacts provided by the National Archives. “Using only one light bulb, we lit five cases of historic artifacts, including the check the U.S. sent to the Czar of Russia to purchase Alaska.” The Autry Museum was given only a month to display the artifacts, but a presentation of the breakthrough lighting technology convinced the National Archives to extend the exhibit to four months. As acceptance of major museums grew, Ruth Ellen knew they needed to formalize the business. “My problem was that there was just my Dad and I, and we knew that we have to start hiring employees to assemble things,” according to Ruth Ellen. In 1995, the Millers decided to leave Pasadena, California and move to Delaware to flee the high taxes and regulations that could inhibit their growth. Together with her parents, Ruth Ellen packed all their personal belongings, with the business inventory and computers into a rented semi-truck and moved 3,200 miles to a new state. NoUVIR Research was first housed in an antique store, that they expanded into a manufacturing facility in Sussex County, Delaware. Right next door to the facility was an 1836 Victorian mansion that Ruth Ellen and her family bought and restored. The house is more than an aesthetic masterpiece. It is a fiber optic education for historic houses and museums. 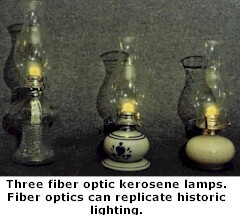 The house is lit by cold fiber optic “flames” from whale-oil ships’ lanterns, antique kerosene lamps and chandeliers, gaslight chandeliers and wall sconces, tubular-wick oil lamps, and other period lights and lighting fixtures. The mansion is now a school for historic building restorers, showing how to light entire rooms without destroying the architectural styling. However, a business is never without challenges. Small manufacturing companies oftentimes fail to dominate their industry because of capital limitations and large business competition. NoUVIR faced all these, and more. In any successful business venture, sharks and predators can’t be far behind. To prevent patent infringement, particularly from large companies, Ruth Ellen made sure that they have strong and thorough patents. 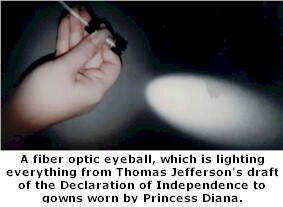 “Fiber optics have been around for a long time, and it has been used for lighting for quite awhile. But we were the first to analyze the physics to really make the breakthroughs.” Despite the high cost of patent application and issue fees, the broad patents were obtained to protect their inventions and the company. As she puts it, “The patents are the only things that kept us from being eaten alive.” Years ago, NoUVIR challenged a major multinational company that was infringing. But faced with a whole family of intelocking patents, the huge company withdrew their infringing products. NoUVIR lighting systems can extend the life of museum exhibits by at least three times, and in some cases fifty times longer than any conventional light source. It typically saves 70 percent lighting energy. Given its unique technology, NoUVIR’s fiber optic lighting system was awarded with 16 U.S. Patents, with additional patents pending. Good inventions, however, do not necessarily make a successful company. Ruth Ellen’s educational background in business and entrepreneurship helped her translate a breakthrough invention into a marketable product. NoUVIR Research is an aggressive, small company with a highly motivated, multi-tasked staff operating as a team. Essentially, NoUVIR assembles each order from parts in inventory and usually slips in a few days, meeting the specific needs of the individual customer. At NoUVIR every employee knows sales and is highly trained in customer service. They work whatever hours are necessary to complete a project on time. Ruth Ellen insists on high standards of quality, as this will, in the long run, determine their fate. Today, the NoUVIR is the leader in museum fiber optic lighting systems. They have lighted important documents, artifacts and paintings from such esteemed institutions as the Smithsonian, the Folger Shakespeare Library, and the Library of Congress, among others. The Millers have had the privilege of casting light on Thomas Jefferson’s handwritten draft of the Declaration of Independence, Abraham Lincoln’s draft of the Gettysburg Address and the draft of the Emancipation Proclamation, and first edition “Prince of Wales” Bible given by King James to his son. Not discriminating between highbrow art and popular culture, NoUVIR has also lighted Dorothy’s sparkling red shoes in The Wizard of Oz, champagne bottles brought up from the Titanic, Babe Ruth’s baseball uniform, Marilyn Monroe’s famous white subway dress from The Seven Year Itch, Faberge’s delicate Dandelion Puff floral pieces, even a Shakespeare manuscript lighted by a fiber optic candle in a 1500’s candlestick. NoUVIR’s clientele has expanded to include expensive homes and commercial applications like restaurants and stores. As Ruth Ellen puts it, “I didn’t realize that silk dresses are so expensive because they have to be hand-rotated in the stores every 10 to 15 days. If not, the store lights will fade the dresses. I didn’t know that meat in the counter discolor in just two to three hours because of the light. The damaged merchandise increases the cost of sales for the store. Creativity and ingenuity pushed NoUVIR to the top of its game. But it is the solid teamwork between Ruth Ellen and her father that serves as the solid foundation of the business. Ruth Ellen belongs to the new breed of small business entrepreneurs — highly trained, technically sophisticated and armed with ample business savvy. She is a gifted artist and a scientist, working to produce a system to protect and preserve art and history. Most of all, she has proven that it takes skill and guts to create a successful business. She has proven that a small business can be dominant in its field through a combination of quality goods and smart business practices. Article originally published in April 2000. Read about a woman inventor's ingenuity and determination to succeed. Ruth Ellen Miller is the President of the fiber optic and lighting company NoUVIR Lighting.